(1) Don't consume regular white table salts. They will wreak havoc on your blood pressure (they tear holes in your blood vessels). Use natural sea salts (celtic salts is one good example), or himalayan pink salts. Salts = minerals. And so, mineral rich products like Concentrace Mineral Drops (or something similar) is highly recommended for our overall health. Enough daily consumption of minerals/salts = strong digestion = more energy and other health benefits. So never forget your daily intake of healthy natural salts. (2) Iodine. Need at least 12.5mg daily, work your way up to 50mg daily (50mg and above is the therapeutic dose). Each Iodoral tablets contain 12.5mg of iodine, so this is one way of getting it. Another way is by painting your skin (preferably on the wrists or on the belly, but can also on the tumor site if possible or on your inner thighs - your choice - just remember that this protocol might stain your clothes). Lugol's Iodine or Nascent Iodine for this protocol (liquid iodine). Either you paint/rub them on your skin, or you consume them orally. If you rub/paint them on your skin, you don't have to worry about dosages. Your body and skin are smart enough - if you need iodine, they will absorb it rather quickly (so the iodine on the skin will fade away rather quickly), or if you have enough iodine in you, the iodine will stay on your skin. Last but not least, get your iodine through foods. Iodine is needed for all our body's cells, but highly concentrated in the thyroid - hence, I call it the thyroid nutrition. When we have enough iodine, our thyroid is healthy, thus we have excellent metabolism and normal balanced hormones. The other way around is also true when we don't have enough iodine: either slow/sluggish thyroid (hypothyroidism) or over thyroid (hyperthyroidism) - either Graves or Hashimoto's. Our hormones will be out of whack - especially for women. Our metabolism would also be out of whack - either we become very fat or we tend to lose weight too easily. ​I do believe everyone should take Iodine one way or another. 12.5mg for normal healthy people should be enough, but 50mg daily is much more preferable (I myself take 25mg daily). If you have started to feel that metallic taste in your mouth, then chances are your iodine levels are adequate. Everyone's metabolic rates are different and unique. Yours probably don't metabolize iodine that fast - hence taking just a small amount of iodine, that iodine will stay in you for quite some time. Compared to me, I'm taking 25mg a day and still haven't reached my "limit". Try adding selenium too (about 200 mcg daily) and see if you can still take 1 Iodoral per day. If you still taste that metal on your mouth/tongue, reduce your iodoral intake. Try maybe once every 2-3 days. If your body have lots of toxicity, you really can't just consume high doses of iodine outright. That's why I always tell people to work their way up - from 12.5mg a day to 50mg a day. Why? Because iodine will start pushing out the toxic halogens in us: bromine/bromide, fluoride and chlorine (and also mercury). This, in my humble opinion, might be what you're experiencing. If done too much and too fast, any detox regiment/protocol could kill you. I agree. So take it one step at a time. Don't rush things. If you must, have a healthcare professional to monitor your progress. What I've explained in my previous posts on iodine was catered more towards cancer patients and prevention. They are not specifically catered for other illnesses such as Graves or Hashimoto's. As a general rule, we all need iodine. That's a fact. As I am not a doctor nor a healthcare professional, I can't monitor your iodine (and selenium) intake. Hence, the need for a personal healthcare professional to monitor your progress in this matter. OK, so you want to begin supplementing with Iodine? Start with 3 drops of Lugol's Iodine onto your skin. See if it is being absorbed quickly (disappears in less than one hour) or not. If it is, have 3 more drops. Keep doing this until the stain stays for about 8 hours (although not very accurate, but it does give you a general idea of how much you are deficient in Iodine). Selenium and Iodine goes hand in hand. Selenium will help convert the T4 hormone to the the active T3 hormone in the thyroid - thus having selenium with iodine is really important. If you are generally healthy, 100 to 200 micrograms of selenium (that's one or two Brazil Nuts) a day should be enough. But if you are trying to heal from cancer, 1000mcg of Selenium is highly recommended. ​We are most likely deficient and not the other way around. It's a bit hard for us to become "overdosed" with iodine - with our common current diet. If you hear people or doctors say that we can experience iodine overdose or iodine allergies, that's totally wrong. VERY IMPORTANT: People with shellfish allergy often avoid iodine products because of a commonly held belief that people with a shellfish allergy also have an allergy to iodine. Having a shellfish allergy, however, does not necessarily mean you’re also allergic to iodine. It is, however, possible to have an allergy to both shellfish and iodine. Ask your doctor if you should use iodine products if you KNOW that you have a shellfish allergy. Iodine is the antagonist for 3 major toxins (halogens), namely bromide (or bromine), fluoride, and chlorine. With enough (high doses) iodine intake, iodine will start to push out those 3 toxins (and also mercury, but that's another story for another time). These 3 toxic chemicals (they are gases, halogens) are usually latched to cell receptors near our skins and all around our thyroid. Thus, less iodine in us, more of those 3 wreaking havoc in our bodies (disrupting metabolism and making all kinds of hormonal problems, especially for females). And so, getting more iodine in us, that's pushing out all those 3 out. Iodine will keep pushing and pushing and pushing until all 3 are near the exit, that is our skin. When this happens, we will feel rashes/hives/itches in some parts of our skin. Hence, "iodine allergy reaction". No it's not. It's not allergy. It's the toxins being pushed out! You want to keep all those toxins in - and not to feel that rashes/itches on your skin, or you want them out and feel (for about 2-3 days) the detox symptoms - the possible itches and the rashes on your skin? The itches/rashes WILL PASS. Don't worry. Unlike skin rashes caused by fungal infection or other pathogens, you really can't do anything about them. You just have to ride them away. So take 12.5 mg of iodine daily for prevention. Getting them through sea vegetables - in my humble opinion - won't come close to that much. But it is still better than nothing. We need iodine daily, everyday. For a whole host of health benefits. While you take Iodine, remember to get enough Selenium...from foods such as Brazil Nuts 3-5 per day is enough for most people. Or, you can supplement with 200 mcg to 1000 mcg per day depending on your illness and defiiency. ​Selenium keeps Iodine faithful...meaning they both work well together, to help your thyroids function in a balanced way. ​"Here's my "theory" on how one develops breast cancer - and how it relates to iodine deficiency: Every one of us, have potentially bad genes. These bad genes are activated ("expressed", as scientists say) with bad nutrition/toxic chemicals in us, and also deficiencies in nutrients. Now, let's say you are deficient in iodine. That might trigger this bad gene, this cancer causing gene (might be PR+, might be ER+, might be HER2+, or any other breast cancer causing genes). Less iodine (deficient in iodine) will let 3 other toxic halogens get into our system: bromide (or bromine), fluoride, and chlorine. These toxic halogens will latch themselves to the supposedly iodine rich tissues in our body, e.g. the thyroid and...you probably have guessed it...the breast tissue! Mercury, would also latch itself to the same receptors. Thus, without enough iodine, all those receptors are empty, and can be filled with either bromide/bromine, fluoride, chlorine and....MERCURY. And where do you get mercury? From amalgams, from root canals! And when you have stress in your life...depression in your life...your vitamin D levels start to go lower, and lower, and lower....Boom! After years of development, now you have breast cancer. Sounds familiar? Does this fit with your profile? More than 90% of the time, the profile above will fit with any breast cancer patient. And so, you see now why Iodine is really, really, really important for prevention and for breast cancer healing (or for any other cancer types as well, for that matter). Aw geez, Pharmaceutical medication would almost always (not always, but most of the time) will wreak havoc in our body. Synthetic iodine/thyroid hormone is not the same with natural iodine. Lugols or Nascent Iodine (or iodine in healthy natural sea salts) are the ones that we need and want, not those synthetic ones. No wonder your body rejects natural iodine so much. You need to do this little by little, gradually, re-introduce your body with the all natural iodine back again. Otherwise, you would just end up being dependent to those synthetic drugs. It's not gonna be easy. That, I "promise" you. But it'll be worth it. Disclaimer: I'm not a doctor nor a healthcare professional of any kind. I'm not a scientist or a researcher. I'm just a geek who read lots and lots of books, and have compared many scientific research papers and articles to have come to this conclusion. 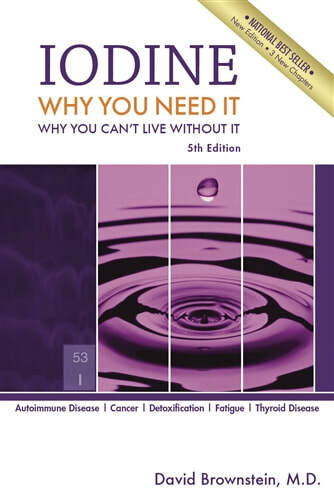 Iodine, Why You Need It, Why You Can't Live Without It! Review as seen on Amazon: "I had been taking Iodoral tablets, and had been out for approx. a month before starting on 50mg/day (8 drops) of 5% Lugol's. I had a huge cleansing reaction at first, which made me think that it's much more potent than the tablet form. After a week I was super fantastic!!! Two years ago, I read the book on Iodine by Dr. David Brownstein, and breast health is the main reason I take this solution. I had a 2cm cyst that was being monitored annually by mammogram (I'm in my 30's) and the cyst is totally gone after taking Iodoral/Lugol's for 2 years. I strongly believe that Iodine is the prevention for breast cancer, maybe even a cure, who knows. Read Dr. Brownstein's book and judge for yourself. He has successfully treated stage 4 breast cancer with it. Here are the Cliff Notes: All your glands need Iodine and our soil is depleted of it, to the point where the government had to start adding it to table salt in the 1920s due to schoolkids developing goiter. The amount you get from iodized salt, however, is just enought to stave off goiter. On the periodic table of the elements, you will see on the second column to the right what are called the Halides. Iodine is a halide, but so are Fluorine, Chlorine, and Bromine. Flourine and Bromine have no nutritional value, and happen to be ubiquitious environmental toxins (yes that even includes the fluoride in toothpaste but that's another story). Now: In the case of Iodine deficiency, which is more common than not in the U.S., Fluorine and Bromine will take the place of Iodine in the glands (thyroid, ovaries, breasts, et al). Dr. Brownstein says that when Iodine was replaced by Bromine as a leavening agent in bread a few decades ago, there was a concurrent and exponential rise in breast cancer. Coincidence? So, the U.S. RDA for Iodine... and remember this is just the amount to prevent goiter.... is 150mcg/day... that's MICROGRAMS. There are 1000 micrograms in a milligram. 2 drops of Lugol's solution has 12 MILLIGRAMS of Iodine. So Dr. Brownstein is treating his patients with megadoses (according to the USRDA) of Iodine. According to Brownstein, Iodine (as Postassium Iodide) was prescribed in old days as a general cure-all for all kinds of maladies. ​Whether you believe that or not, taking Lugol's cannot hurt you, it can only help you. You will probably will experience a cleansing reaction at first (flu-like symptoms and irritability), as the Iodine kicks all that Fluorine and Bromine out of your glands and takes its place. Drink lots of water, get extra sleep for a week or so and you'll feel GREAT!!! If this review saves just one person I will be ecstatic."